When Chris Tomlin's latest album, Burning Lights, was released this past January, it debuted at number one on the Billboard 200 chart, making it only the fourth Christian album in history to do so. To support the new album, Tomlin and his band are once again back out on the road for a two-month, 36-date U.S. arena tour, and along with them for the trek is Renewed Vision's ProPresenter 5 lyric and media presentation software. Although Tomlin's production team has now been relying on ProPresenter for well over a decade, the expanded feature set of the software's latest version is allowing the band and crew to find new ways to improve the concert-going experience for fans. According to Matt Gilder, Tomlin's musical director and keyboard player, one of those improvements has been the ability to trigger video clips for the tour's 13'x40' LED wall directly from his keyboard. Running Ableton Live on an Apple MacBook Pro, which also contains the show's click and supplemental tracks, Gilder interfaces the laptop with his Roland A-500 PRO MIDI controller and to one of the tour's video computers offstage running ProPresenter via Ethernet. "For video playback on tours in the past, we've had to use SMPTE timecode and lock everything down to a click track with no getting off the map, "Gilder recalls. "But ProPresenter 5 enables us to set up a bunch of video cues in advance that I can easily trigger during performances simply by playing a predetermined chord. "To illustrate, 'God's Great Dance Floor' has typically been the lead song on our set list for this tour. At the beginning of the show, I bring up the initial bank of videos I'll be accessing by hitting a MIDI note at a certain velocity. Partway into the song, when I play a C#5, the first use of that chord triggers the appropriate video to be displayed on the LED wall. Then, when I hit my second cue chord--say G5--it triggers the next video right on time. 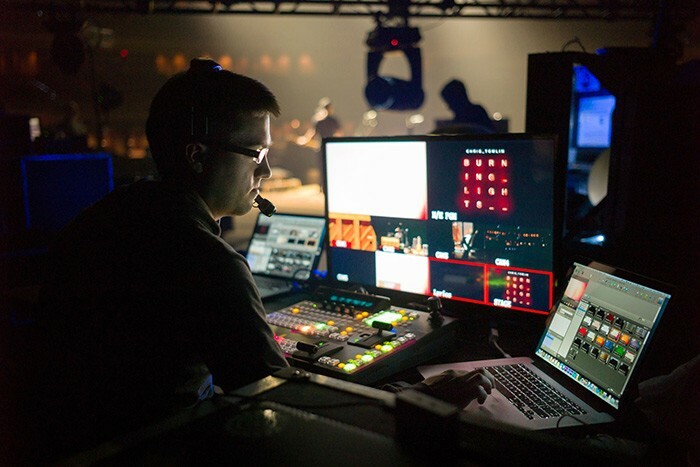 Not only does this make life easier for our crew running the video switcher and lyrics, but it also ensures that video content is perfectly in sync with the songs, even if we stretch out a verse or chorus somewhere along the way." Although many of the videos that Gilder triggers in ProPresenter are strictly visual, some are paired with an audio track in Ableton Live--in particular, a spoken-word piece from Lecrae during the bridge of "Awake My Soul." "I was really nervous about that clip, which is basically a close-up view of Lecrae's face," says Gilder. "The timing has to be absolutely perfect because the band drops out for a moment right on his last word. But now that we're more than halfway through the tour, I can honestly say that this new approach has been super-tight with zero latency. Before this, I always thought that if we weren't using SMPTE or MIDI timecode to lock everything up that we were just asking for trouble. But here we are on the biggest Contemporary tour out there right now relying on ProPresenter every night and it's working like a rock-solid champ. I'm extremely impressed." Rusty Anderson, video director for the Burning Lights tour, points out another unique way they're able to utilize ProPresenter--to post Tweets from the audience during the intermission time between opener Kari Jobe's performance and Tomlin's. "In the 15-minute gap between Kari's and Chris' sets, DJ Promote comes out to spin a few songs and asks the crowd to Tweet what songs they want to hear and generally comment on the show so far," says Anderson. "So he'll announce Chris' and Kari's Twitter handles, as well as his own, and these Tweets start feeding into the same machine that handles the show lyrics. Our ProPresenter operator sorts through the incoming Tweets and clicks on the ones we want to make active, at which point I start putting them up on the screens so people can see what they've just Tweeted. At the same time, we're also moving cameras around and putting audience members up on the screens, which has really helped build excitement and anticipation until Chris and his band come out. "One other thing that ProPresenter has allowed me to do is to customize the live video to match our pre-recorded content. I play various loops of graphic material--things like film noise, burns and color--in ProPresenter on my laptop, and I'll often key that over the IMAG to best fit the particular mood of a song. For example, Lecrae's video in the middle of 'Awake My Soul' features a lot of lens flares, so when we cut back to live video on all three screens again, I'll overlay lens flares on the IMAG for visual continuity. And I can just as easily manipulate color, hue, saturation and a bunch of other parameters on the fly, all of which look beautiful up on the big screens. ProPresenter always keeps us looking great." Chris Tomlin's Burning Lights tour, which kicked off in Charleston, West Virginia, wraps up with a final performance at Denver's Red Rocks Amphitheatre on May 4. For more details on the tour, visit www.christomlin.com/burning-lights. 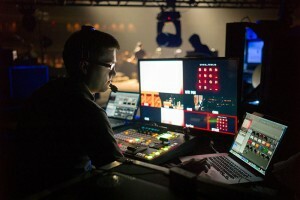 Headquartered in Alpharetta, Georgia, Renewed Vision is a leading manufacturer of cross-platform video production software for a myriad of professional environments, including live concerts, houses of worship, sporting events, conferences and even broadcast television. Founded in 2000 with the premise of "enhancing environments through technology," Renewed Vision's three core products--ProPresenter, ProVideoPlayer and ProVideoSync--are all widely celebrated for their stability, ease of use and affordability.